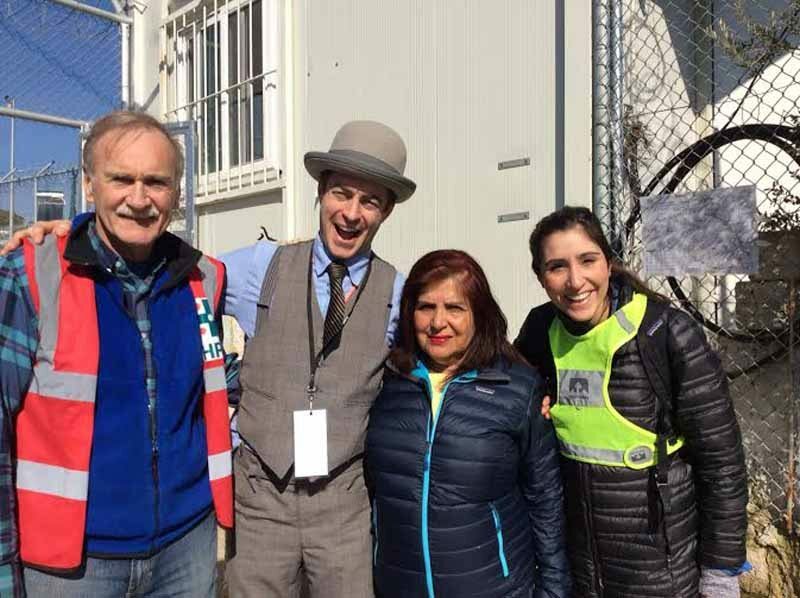 Latifa and Colin Woodhouse just returned from the White House. 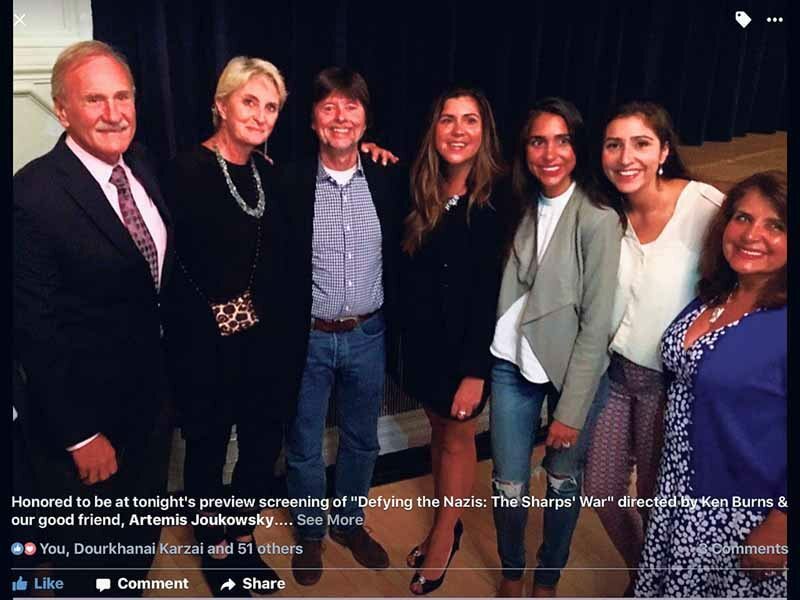 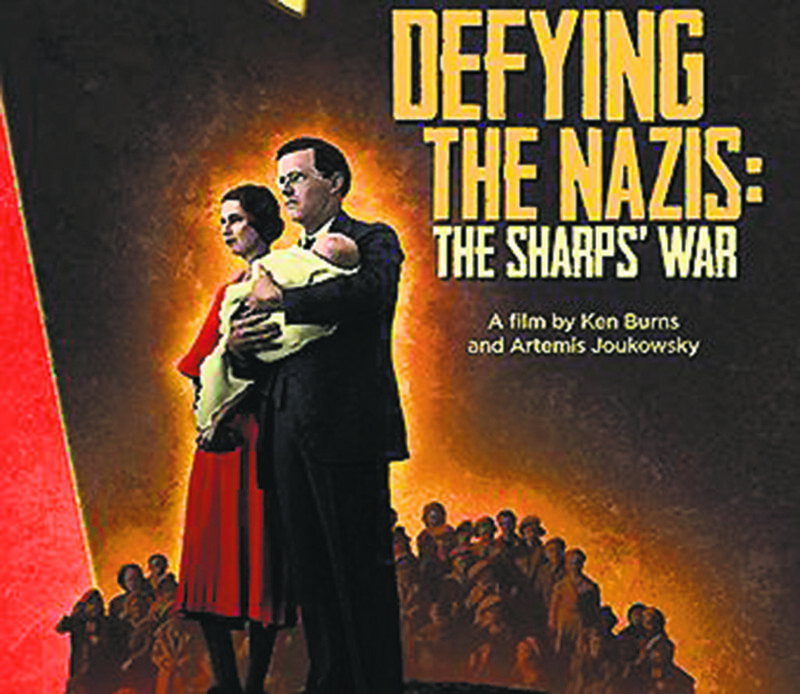 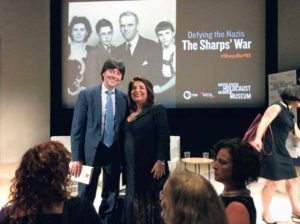 In recognition of their humanitarian efforts to the refugee crisis earlier this year in Lesvos, Greece, the couple was invited for a screening of the PBS film Defying the Nazis: The Sharps’ War, which was produced by Ken Burns and Artemis Joukowsky, the grandson of the Sharps. The film tells the story of a Unitarian minister and his wife who undertook dangerous missions in Nazi-occupied Europe to rescue Jews, dissidents and refugee children. 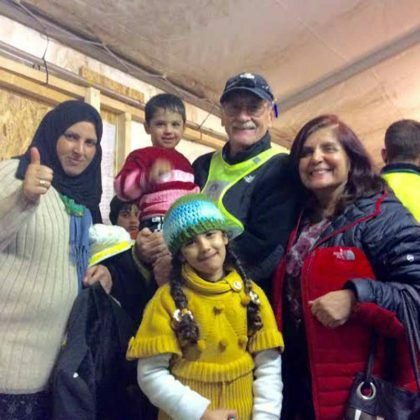 Similarly, the Woodhouses, who are members of the Unitarian Universalist Congregation at Shelter Rock (UUCSR), went to Europe to help with the current refugee crisis. 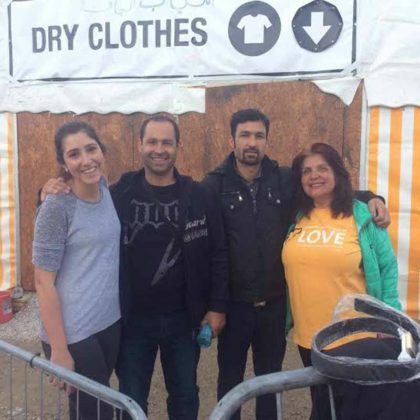 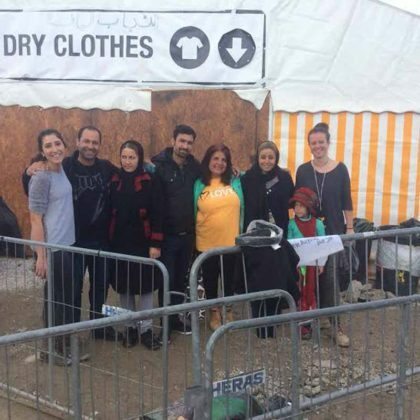 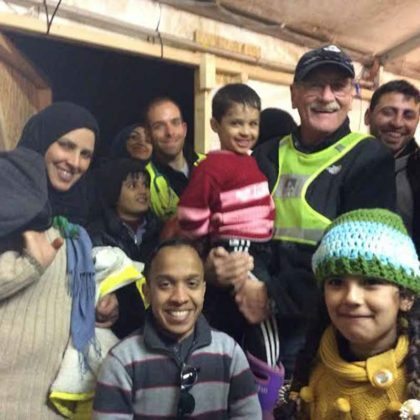 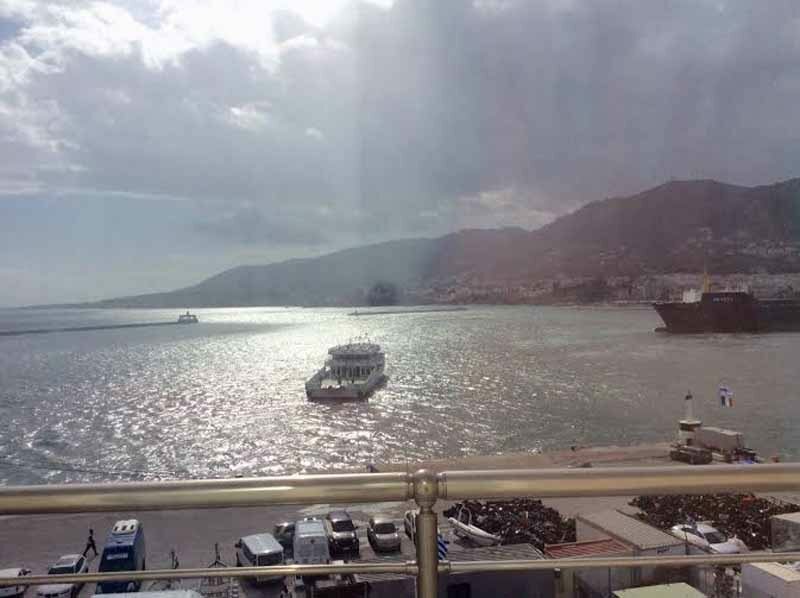 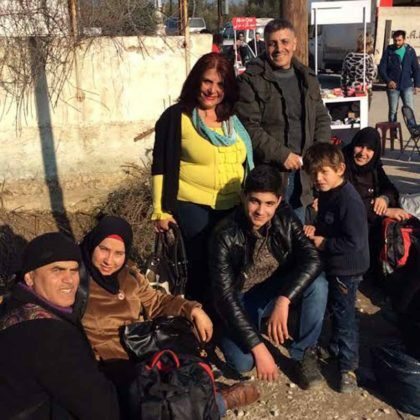 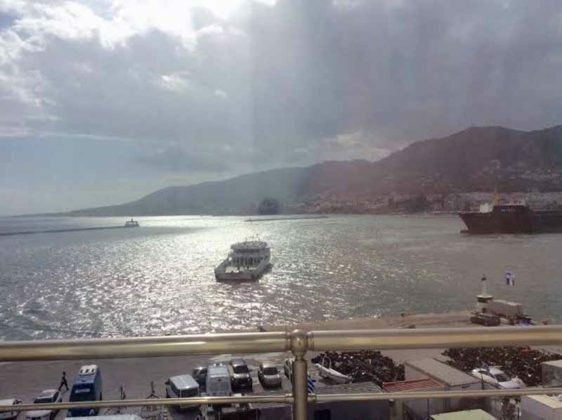 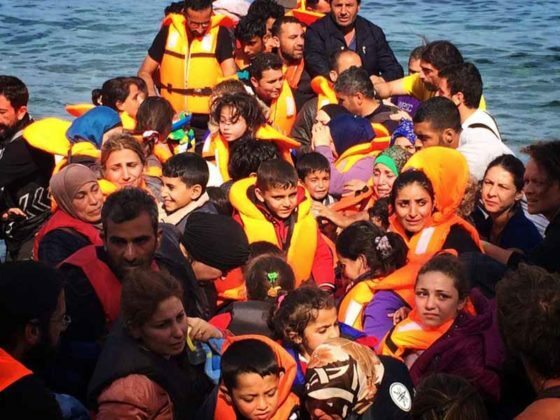 “We need your help” is the refrain on the Facebook group Humanitarian Mission to Greece to Help Refugees, started earlier this year by members of the Woodhouse family who are doing all they can to help. 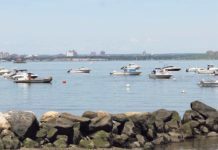 The Woodhouses live in Great Neck, are extremely involved with their church, and all five of their children have graduated from Great Neck schools. 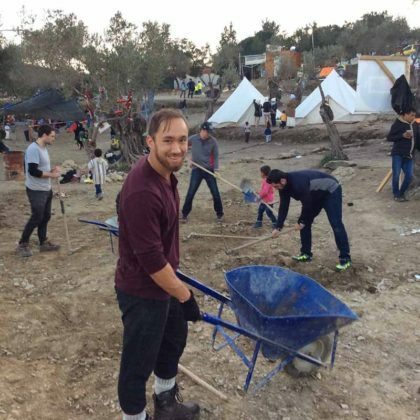 They’re also social-justice activists and humanitarians who met and fell in love while working with the Peace Corps, and have since extended a helping hand during times of crisis, like rebuilding after Hurricane Katrina and cleaning up the beaches after Hurricane Sandy. Despite living on the Gold Coast of Long Island for many years, Latifa and Colin are no stranger to the plight of refugees. In fact, Latifa is the daughter of refugees. 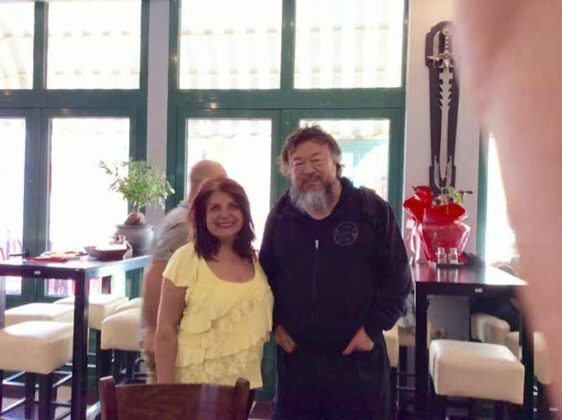 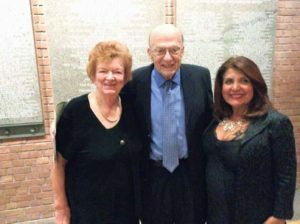 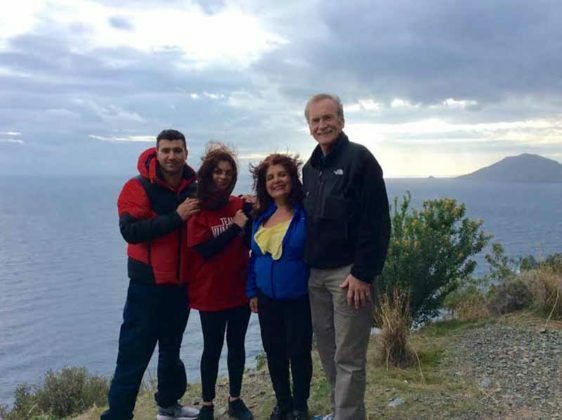 When the Soviet Union invaded Afghanistan, the couple sponsored several members of Latifa’s family so they could emigrate safely to the U.S.
“In 1979, my husband, Colin, and I helped my parents as refugees get into the U.S., [along with] 15 members of our family, my 75-year-old grandma, my brothers, sisters, etc.,” Latifa explained. 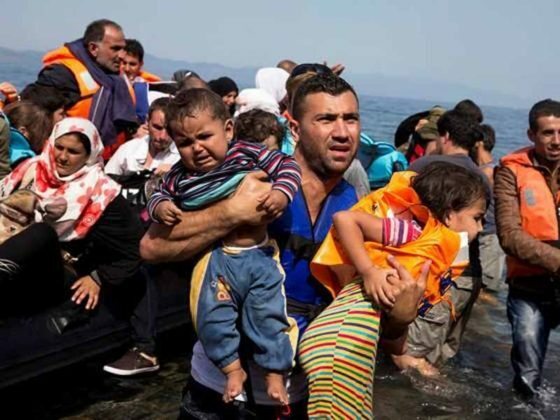 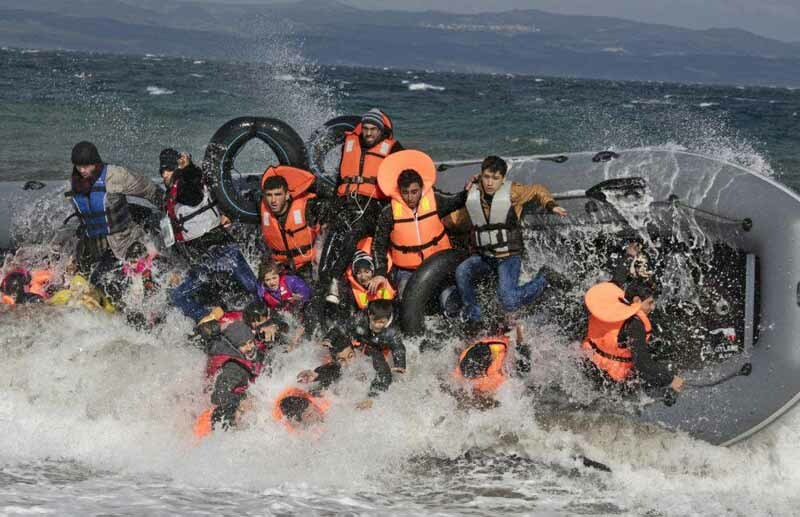 Already sensitive to the issues that refugees face on their dangerous journeys, it was the viral photograph of the young Kurdish boy washed ashore after drowning in the Mediterranean Sea that rocked the world, and subsequently, shocked the Woodhouses into action. 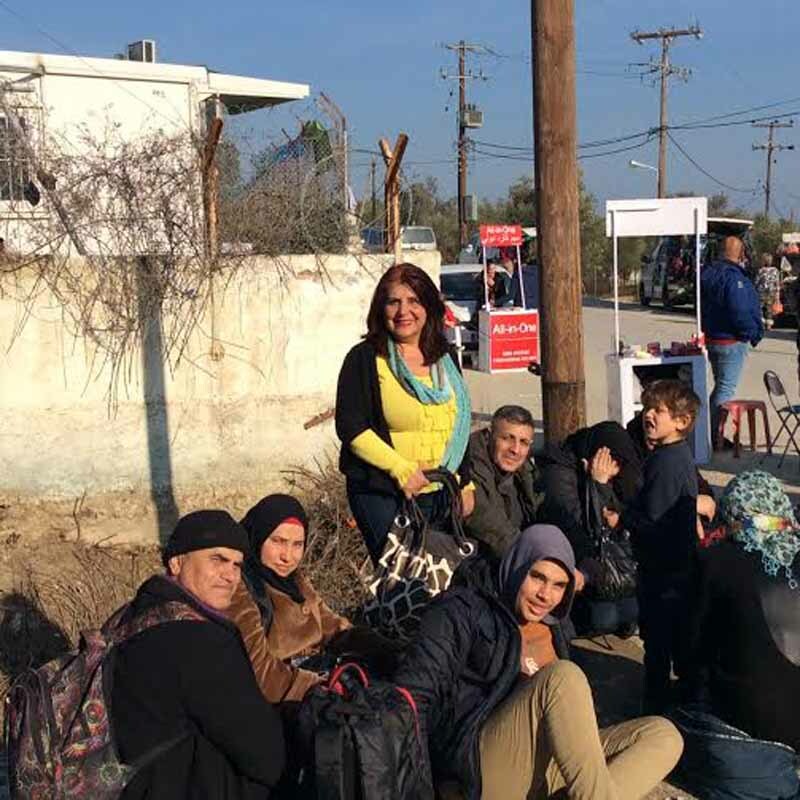 Latifa’s first step was to go to her congregation, where she is a board trustee, to see what it could do to help. 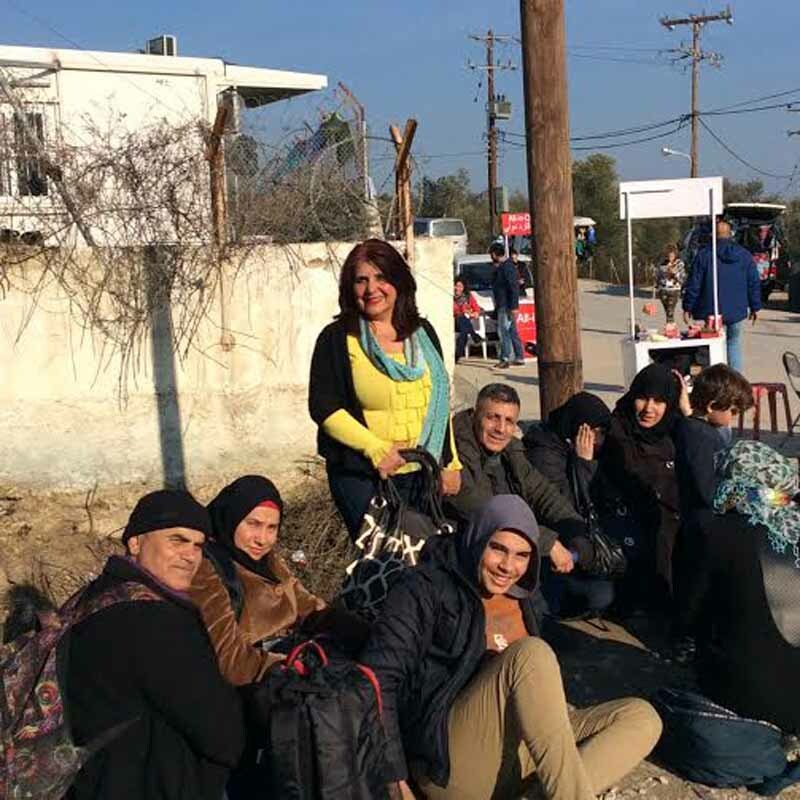 UUCSR also has a history of helping people who’ve had to escape their countries. 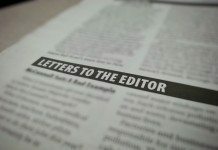 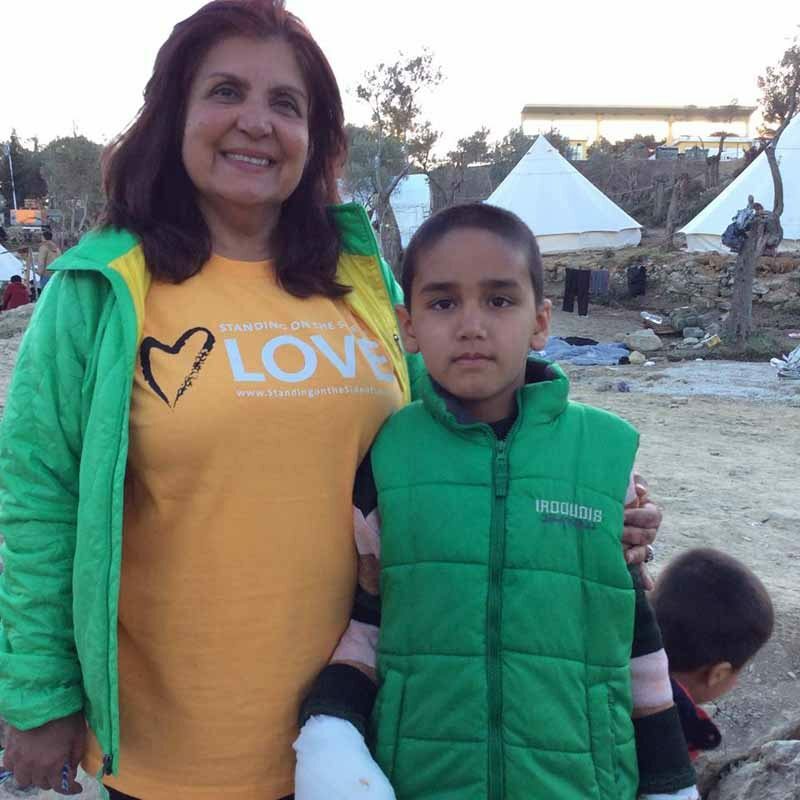 The board and the Social Justice Committee unanimously supported a crisis grant of $200,000, of which $100,000 was given to the human-rights organization of the Unitarian Univer-salist Service Committee, and $100,000 was given to medical staff in Jordan. 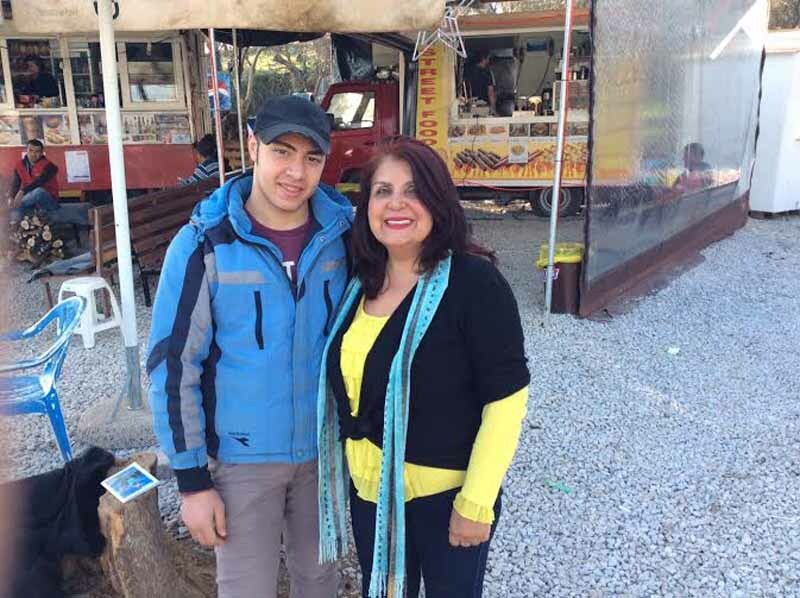 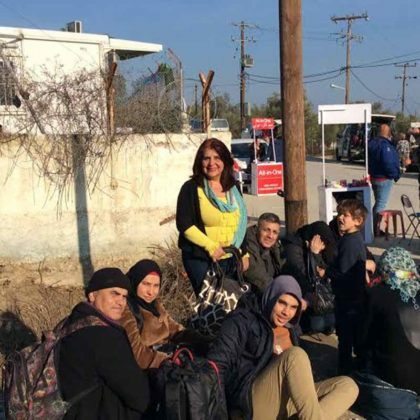 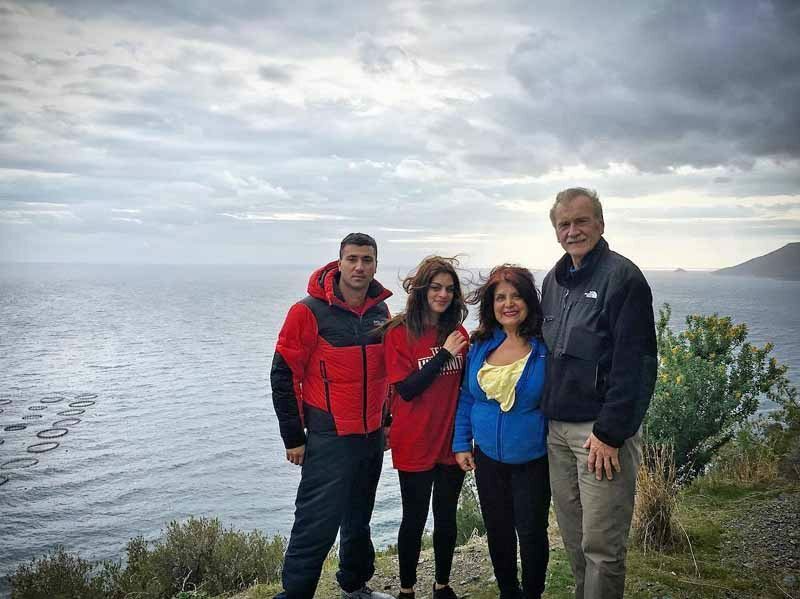 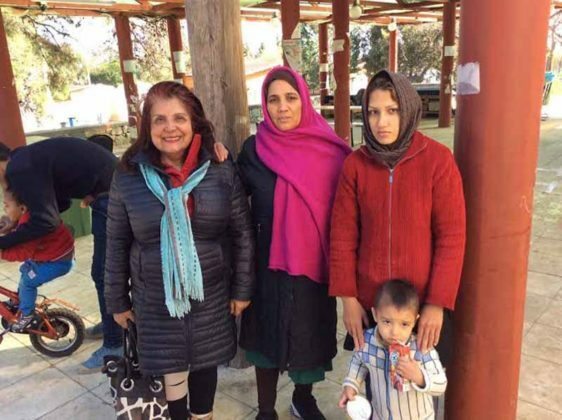 Once they decided to go to Greece, Latifa and Colin’s children—all grown with successful careers—said, “Mom, we will help you.” While Latifa and Colin tried to recruit people to join them on their trip, their children raised money. 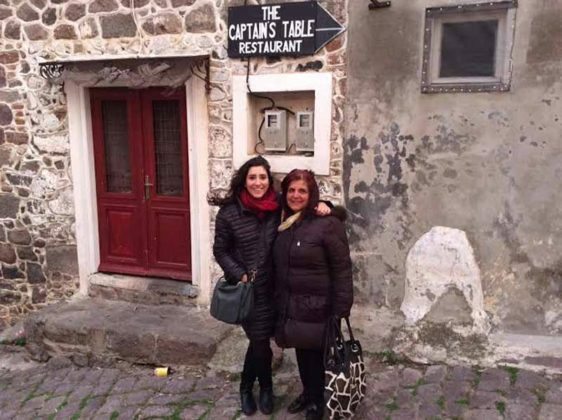 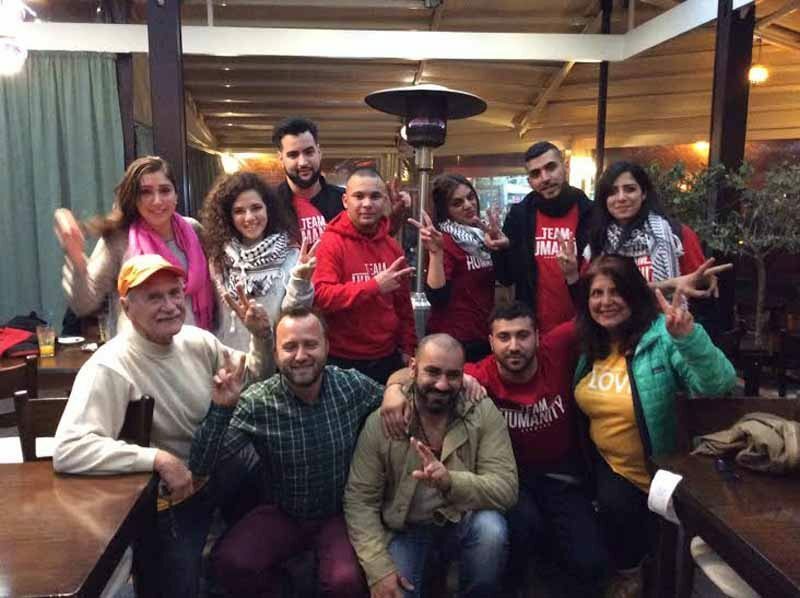 Alexandra and Sophia, both involved in humanitarian work, raised funds through friends and connections; Evan, an event planner, had several functions and recruited Manhattan restaurants of Palestinian and Syrian descent to participate. 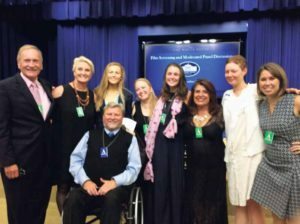 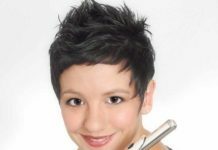 Jessica, involved in law, navigated the family through advertising and raising the money, and Sarah, the technical expert, set up and updated the Facebook page, which promoted the mission through social media. 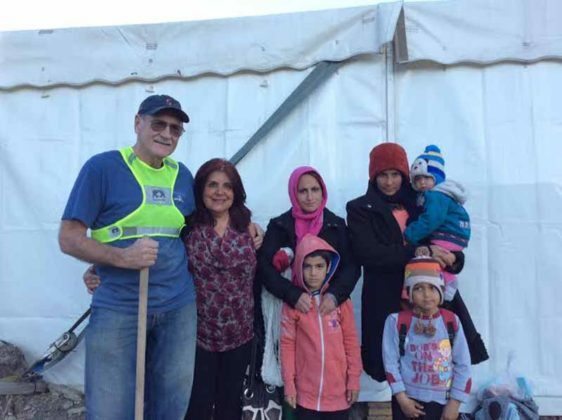 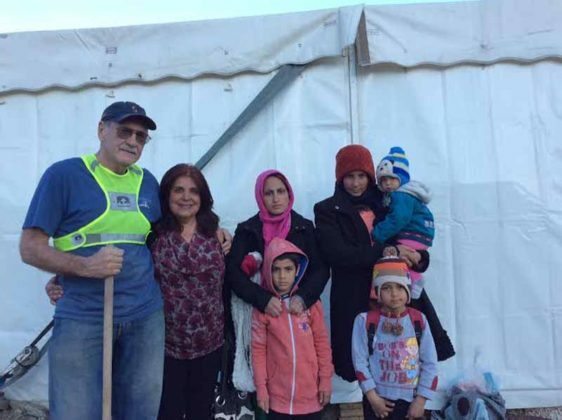 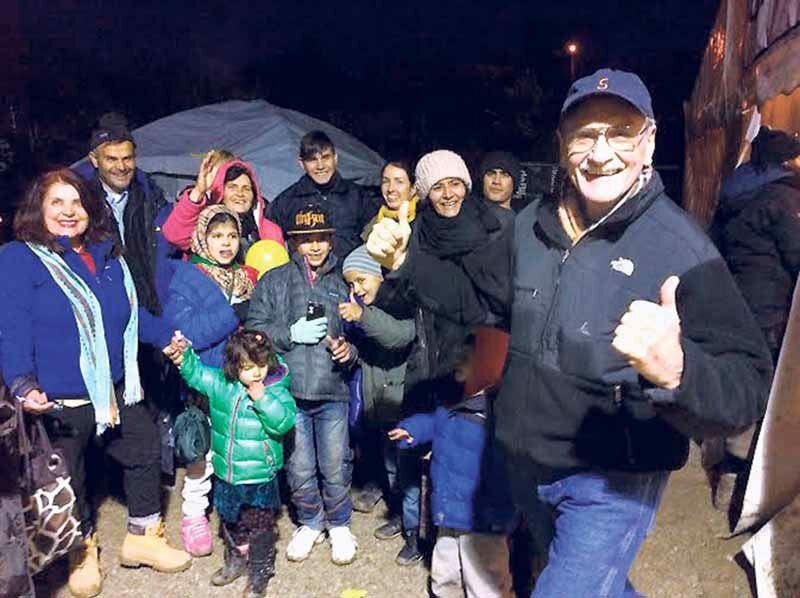 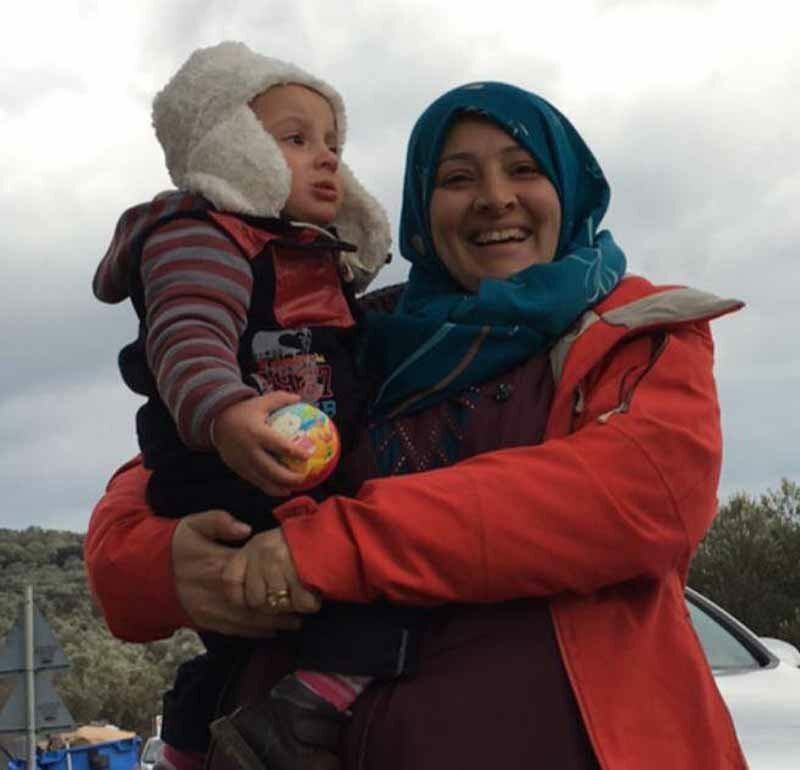 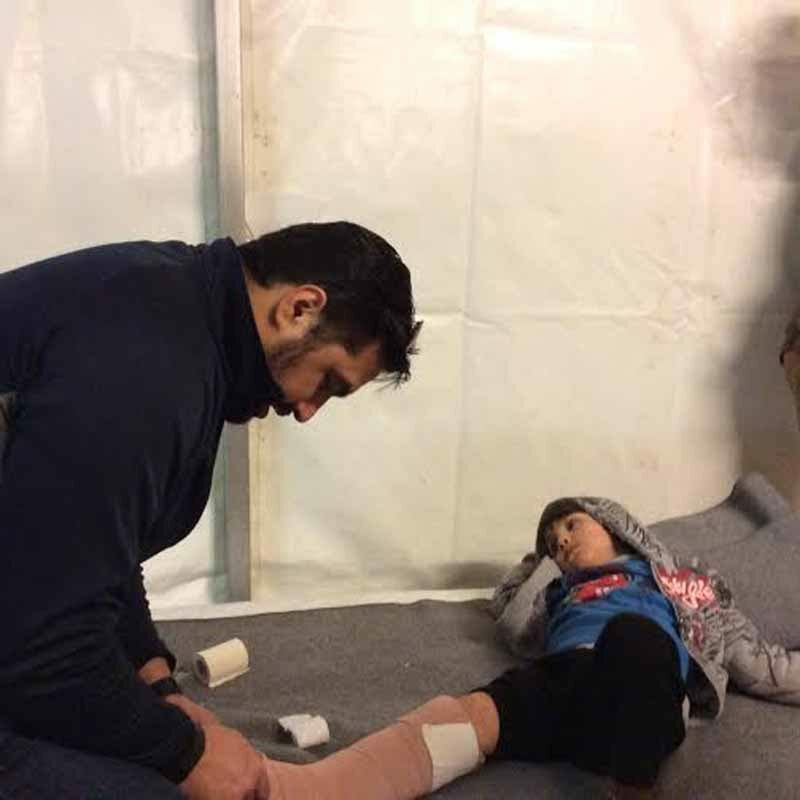 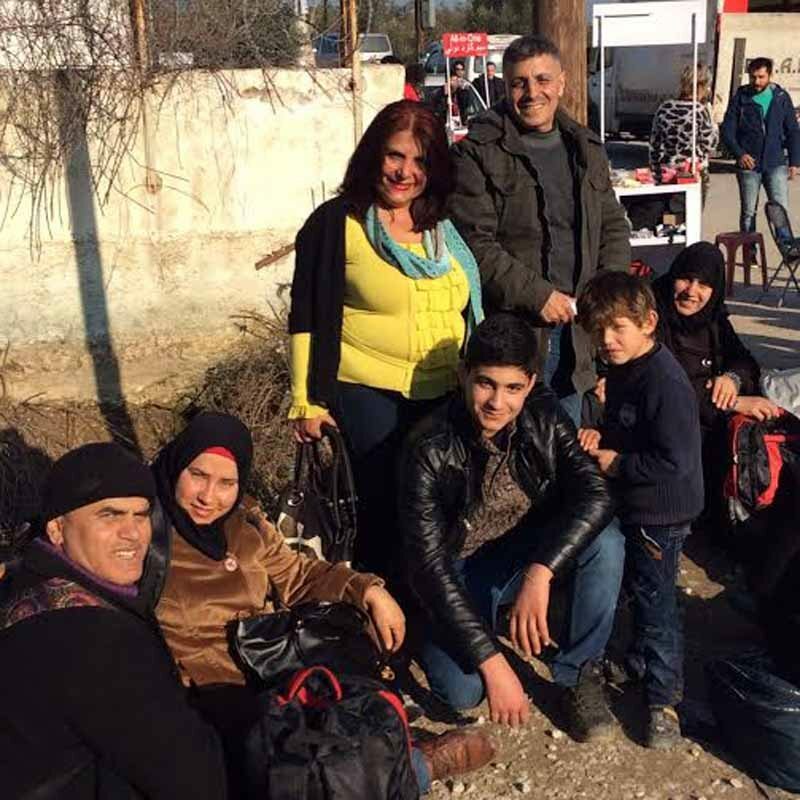 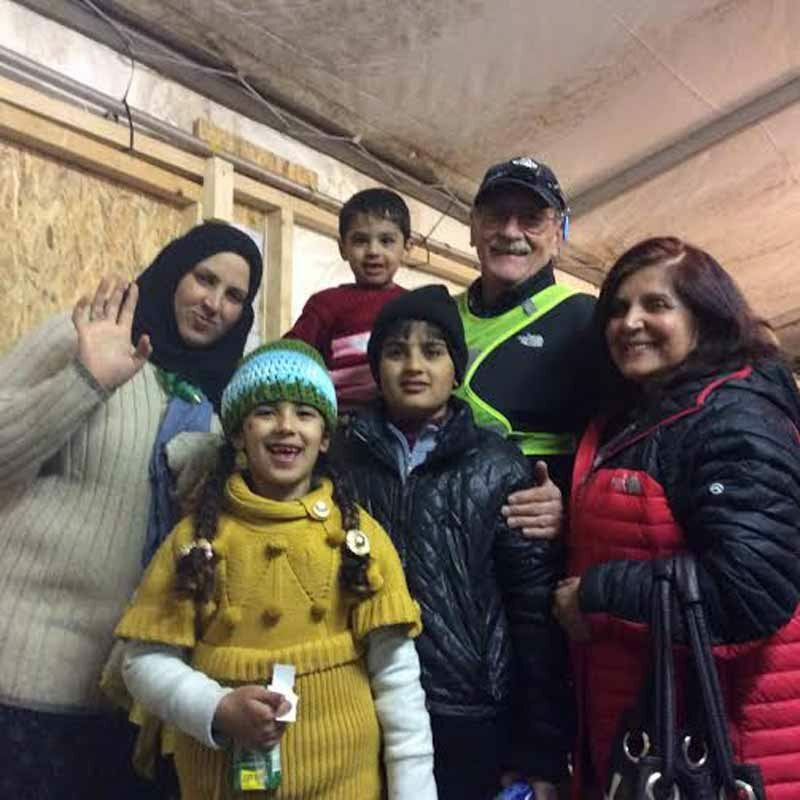 On Jan. 24, Team Mission to Lesvos, which included Latifa, Colin and pediatrician Dr. Diane Lombardy, set off on a monthlong trip, armed with donations and determination. A few days later, their daughter Alexandra joined them. 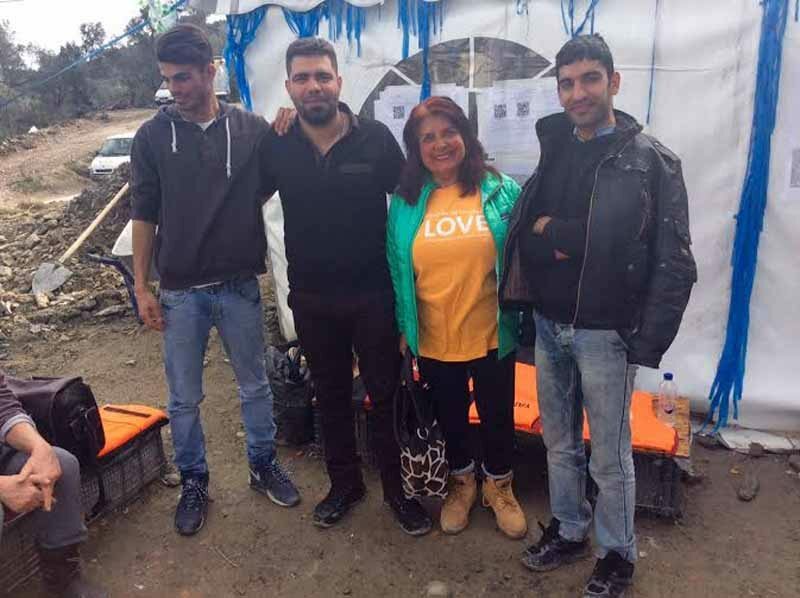 Once they arrived at Camp Moria, an old Greek prison that was turned into a refugee camp, they distributed the supplies to people who needed them desperately. 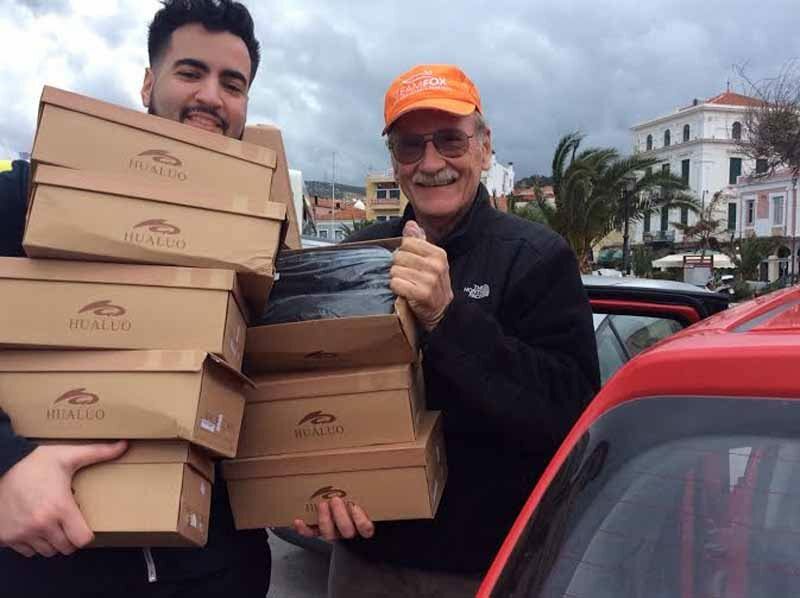 This not only included donated Patagonia jackets, shoes, backpacks and medical equipment, but also care by Dr. Lombardy and her association with the nonprofit Healthpoint. Latifa and Alexandra’s knowledge of several languages proved to be invaluable. Because Latifa is fluent in Farsi and Pashto, and is able to understand Arabic and Urdu, and Alexandra can speak Arabic due to her work with the UN, they quickly became translators and were needed everywhere. 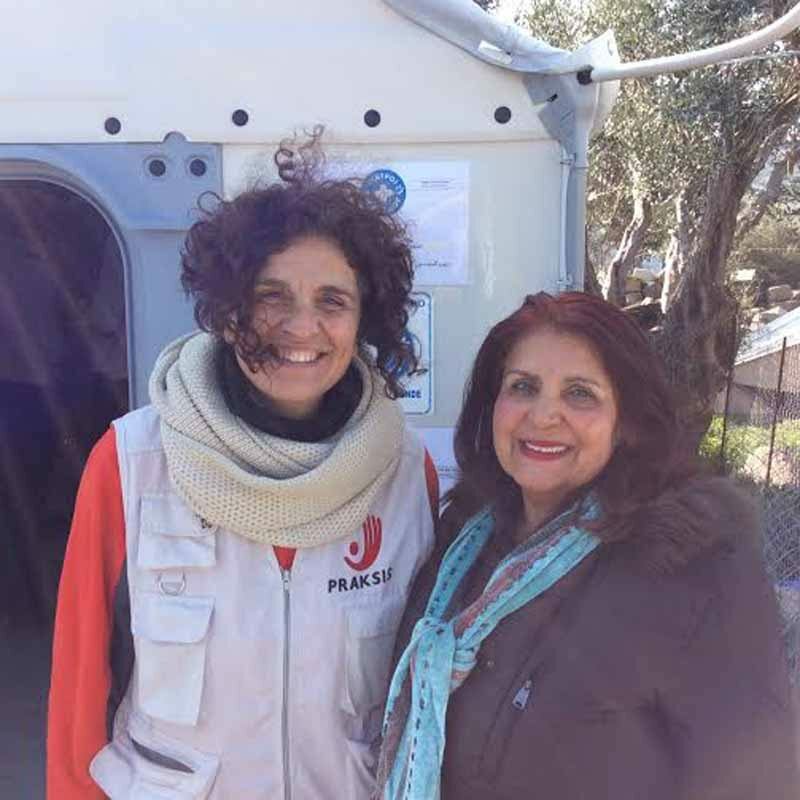 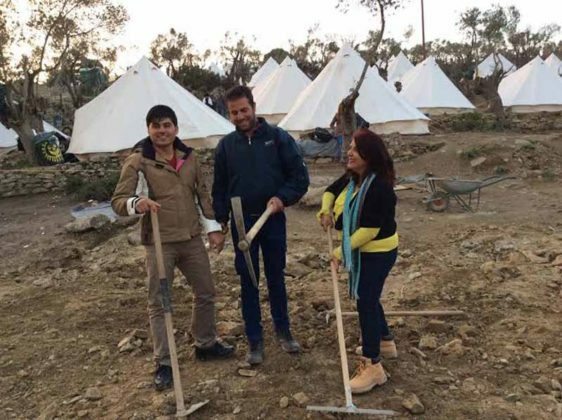 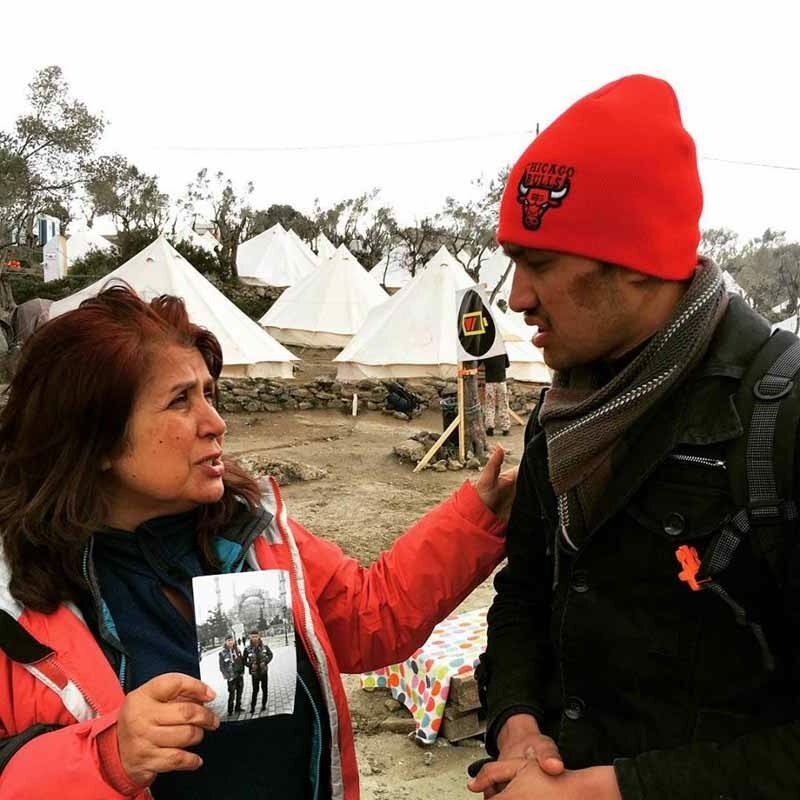 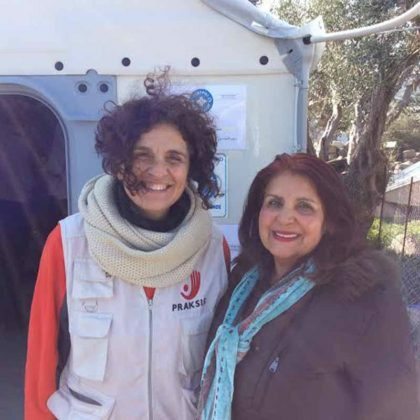 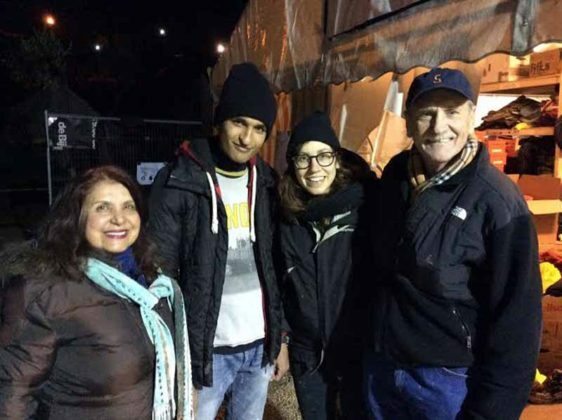 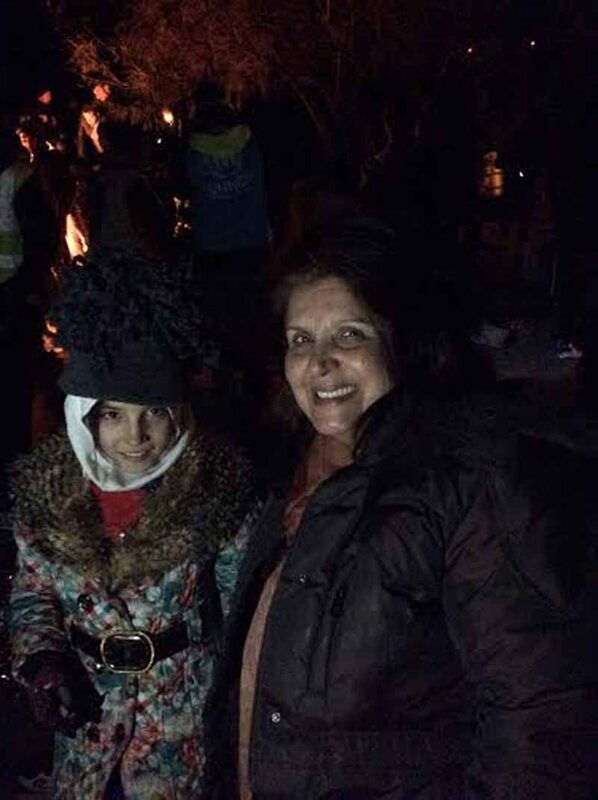 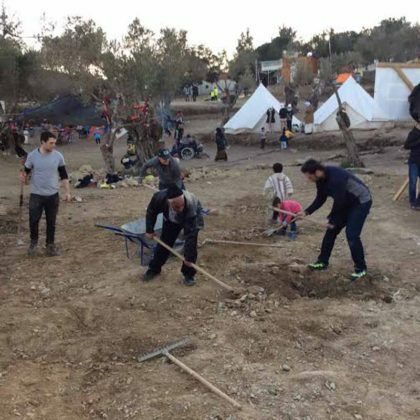 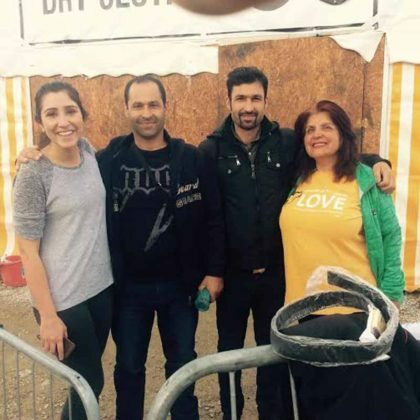 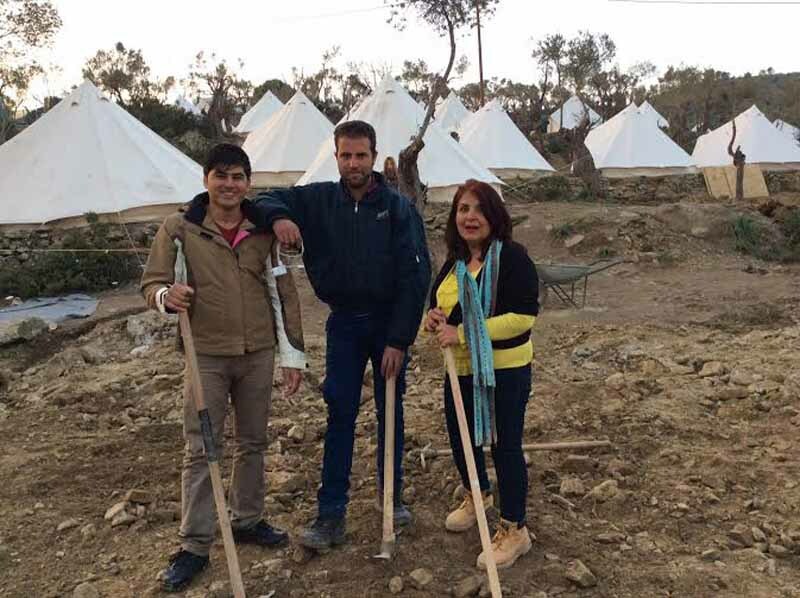 “Volunteers from all over the world, especially young people, came to help, and because [of those] volunteers, they built tents—a drying clothing tent, a tea tent, a medical tent…,” said Latifa. 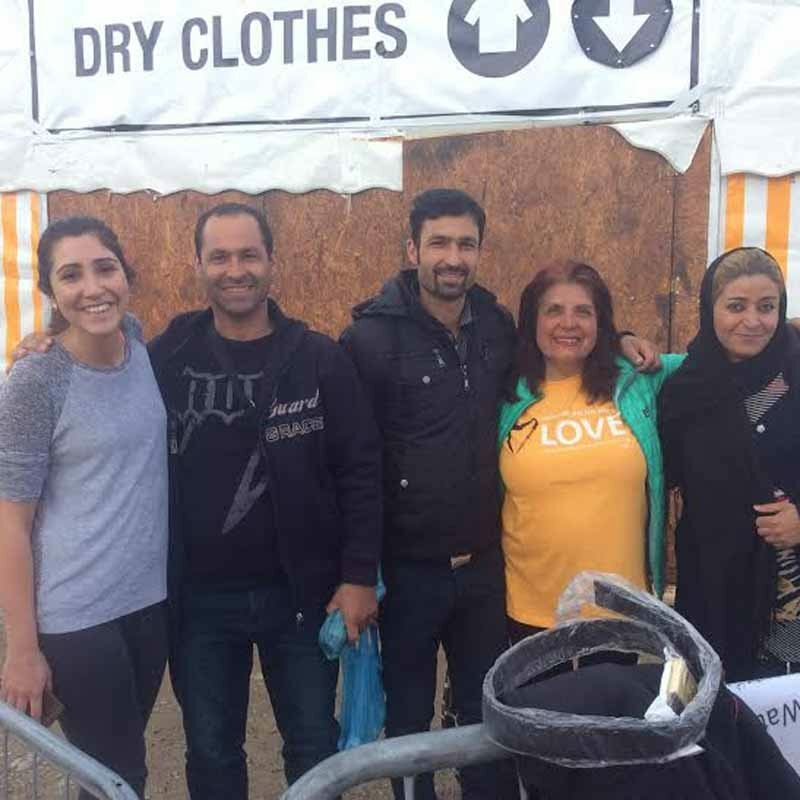 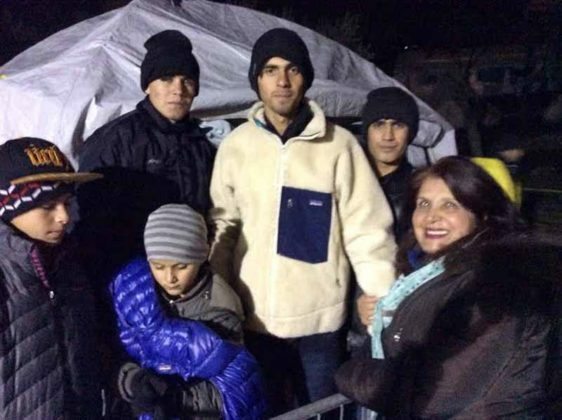 When the detention center services shut down for the night, these volunteers not only provided food, medical aid and clothing, but also talked with the thousands who were passing through. 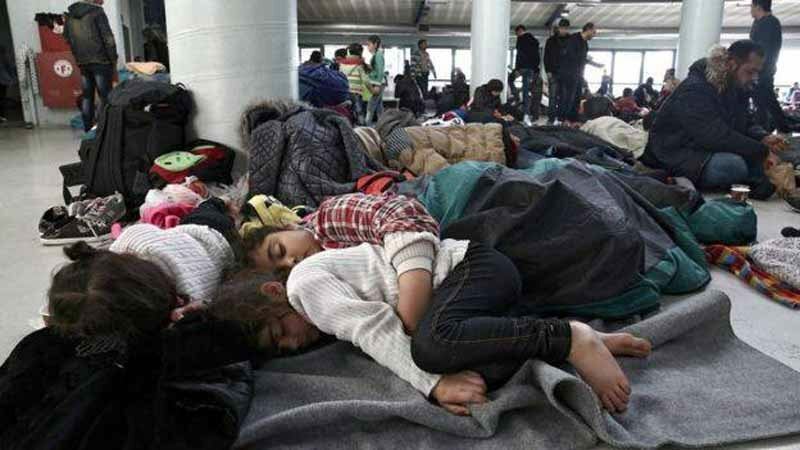 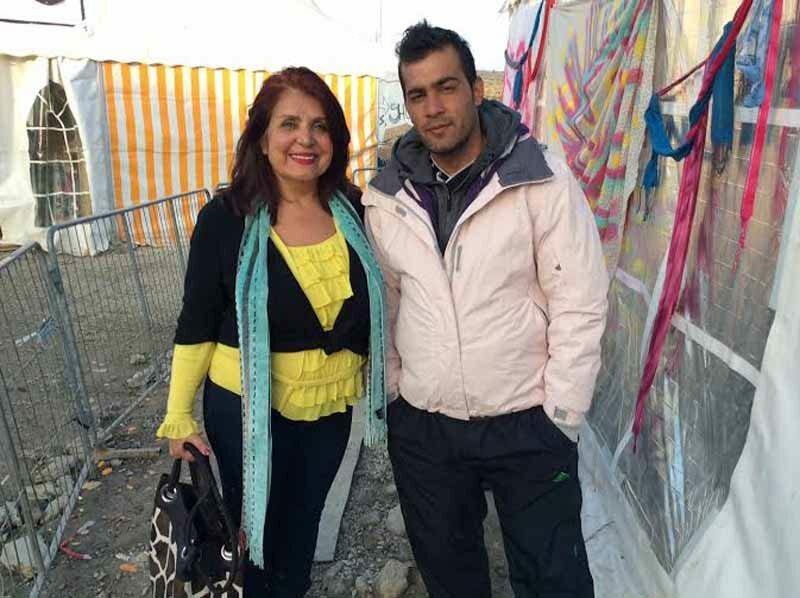 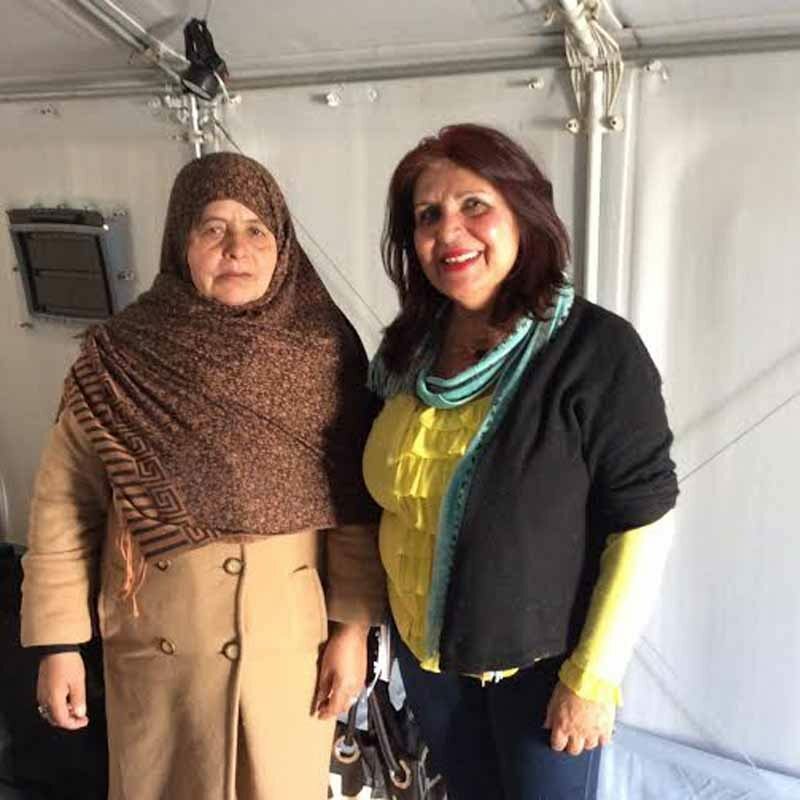 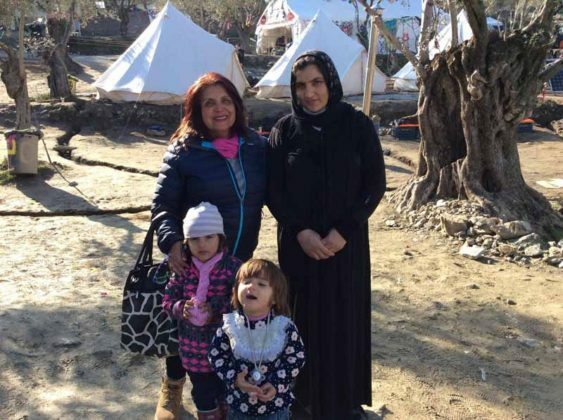 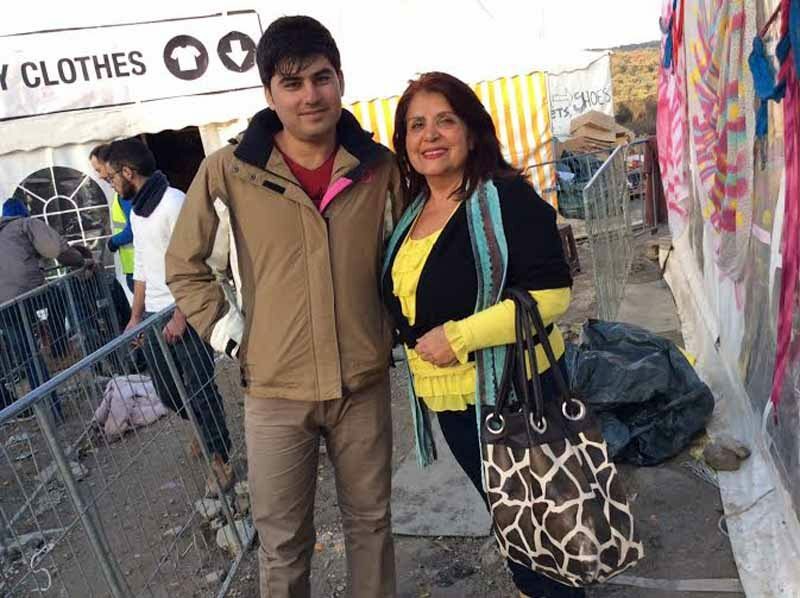 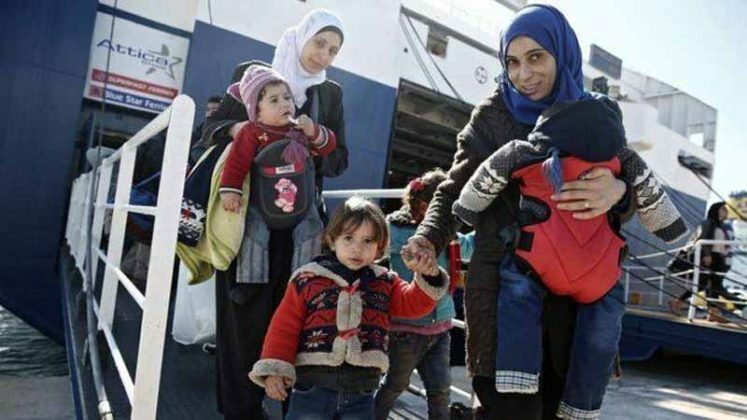 “We worked hand-in-hand and face-to-face to ease the pain of these devastated and scared refugees from many different countries,” said Latifa, explaining that they weren’t just Syrian but also Afghan, Iraqi and more. 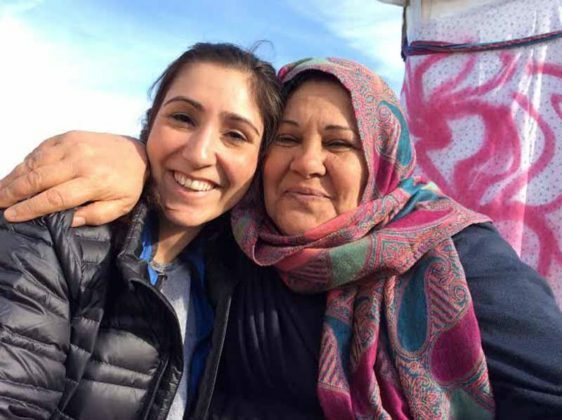 Jawed’s mother related their harrowing tale of how she left Afghanistan by paying smugglers $7,000 to transport them part of the way by bus. 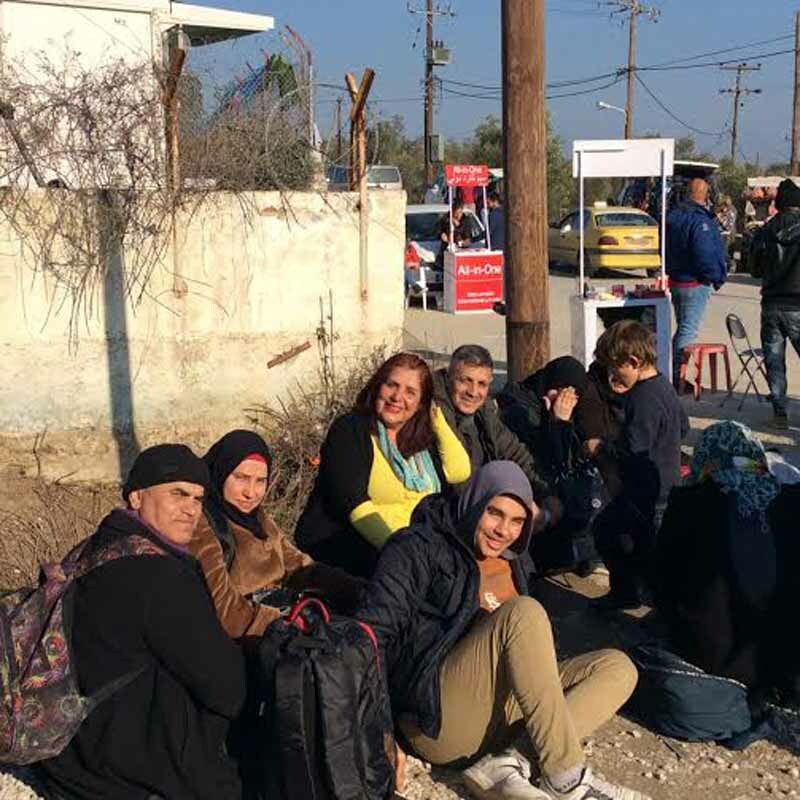 Unfortunately, there was heavy snow in Iran and the bus couldn’t make it, so the smugglers told the 22 members of the family that it would only be a 20-minute walk to their next destination. 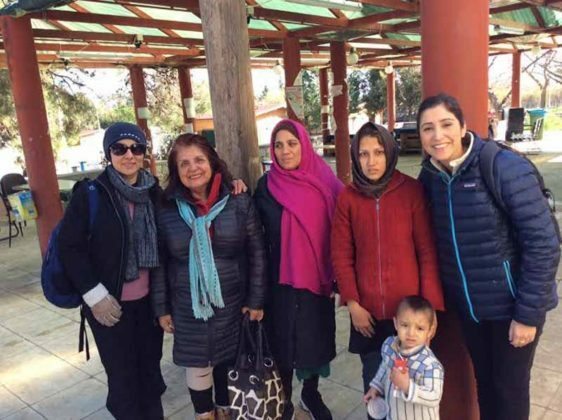 It wound up being a 23-hour trek across the mountains from Iran to Turkey. 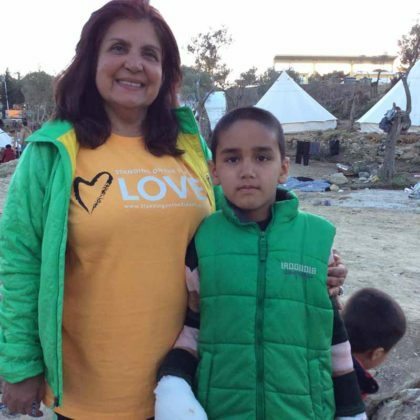 Traveling in knee-deep snow, the family lost their great-grandmother to frostbite and, Jawed, in agony with his blood-covered bandages, was dangerously close to losing his hands. 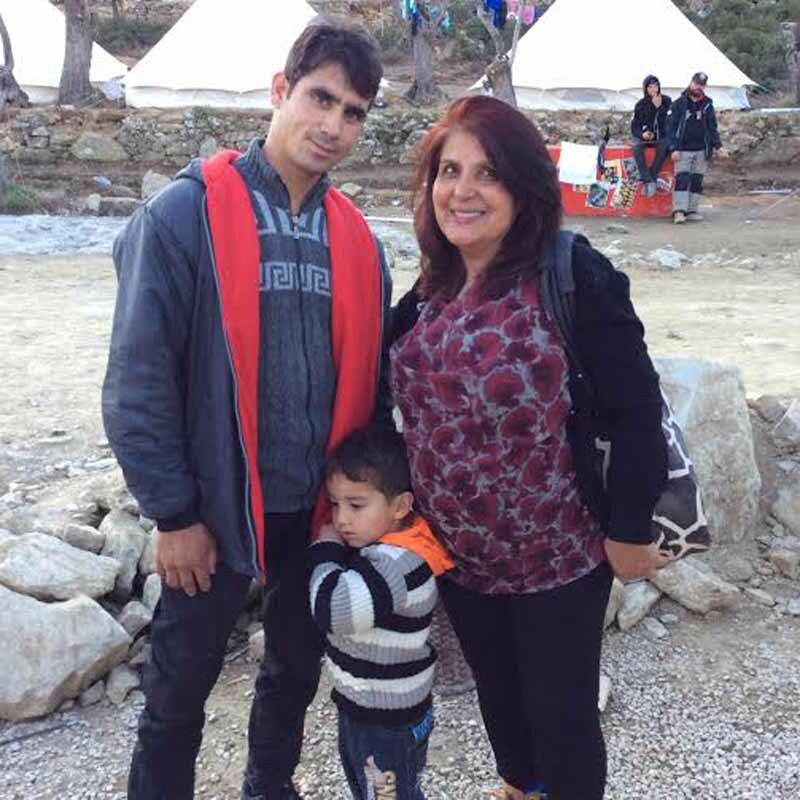 Unfortunately, before a surgeon could help Jawed, the family disappeared from the camp, and Latifa was devastated. 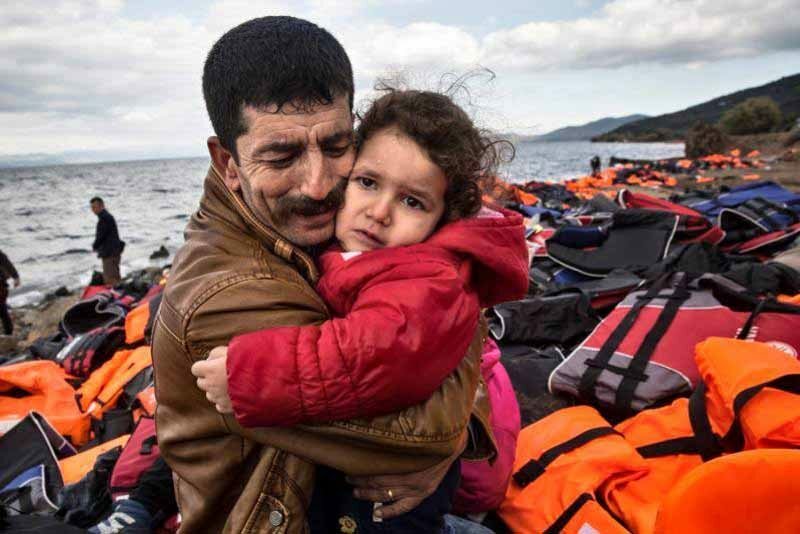 But she never forgot them and continued to search. 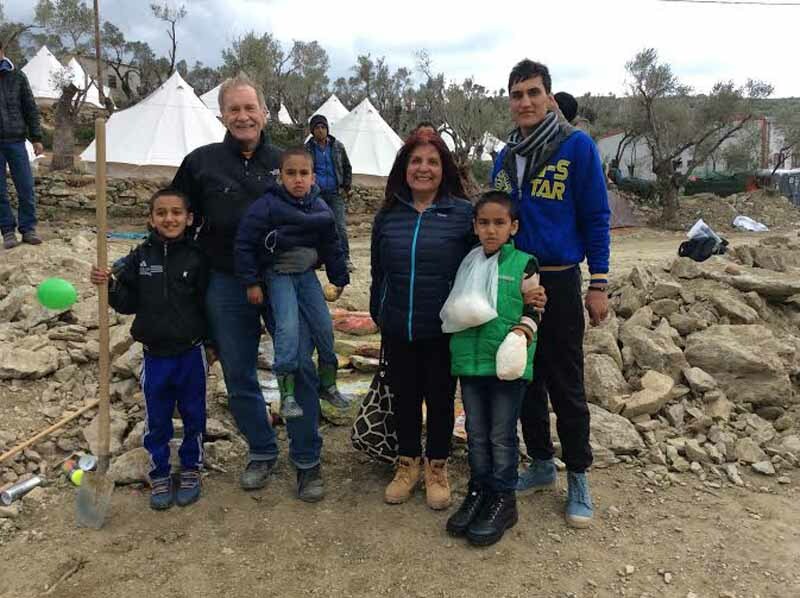 Finally, the Woodhouses learned from Doctors Without Borders that the boy had returned with his immediate family, they were safe and doctors were trying to save Jawed’s hands. 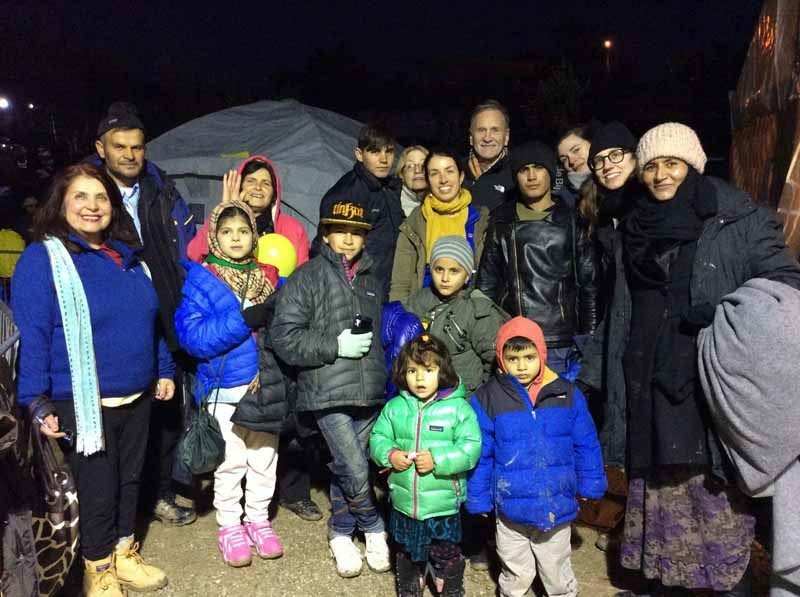 It’s been several months since the Woodhouses made the trip. Their current mission is to promote awareness for the plight of refugees, and to spread the word about the many ways to help. 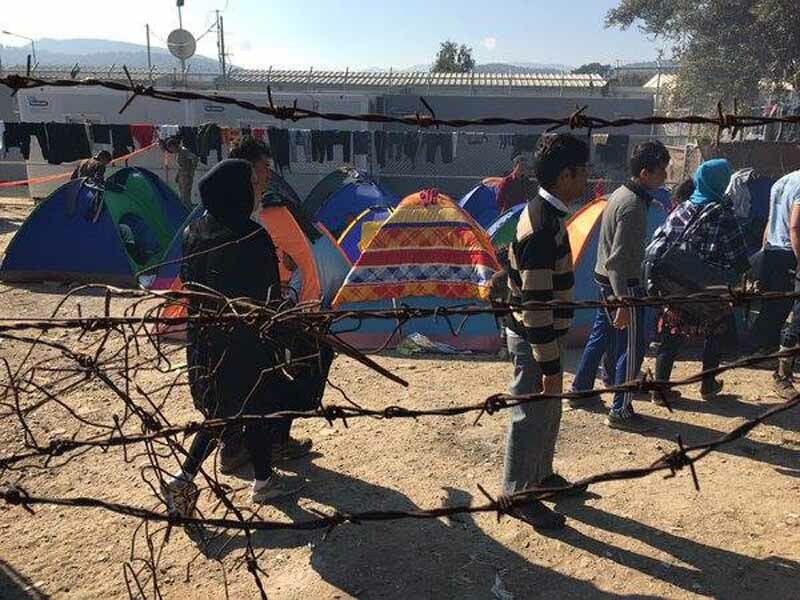 There’s a desperate need for translators in these camps, as well as for human-rights lawyers and volunteers to build tents. 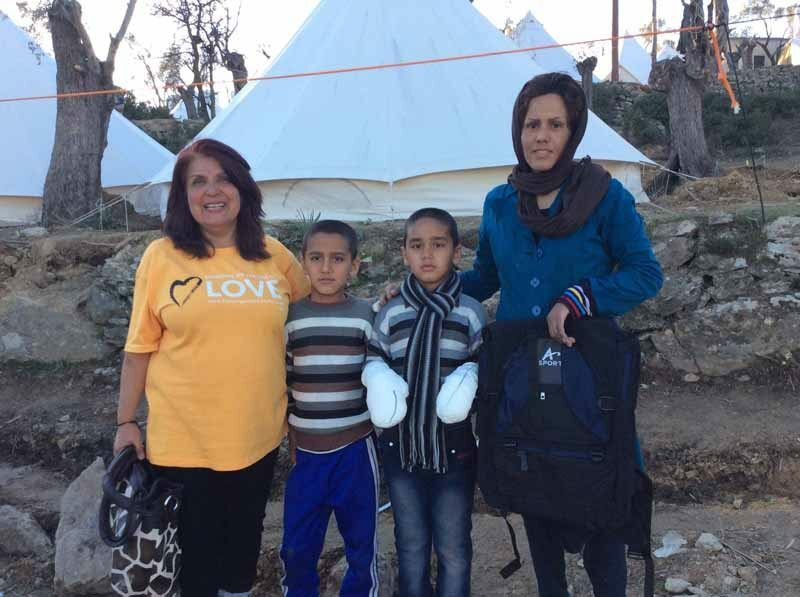 Even if someone can’t go to Greece, donations are needed; the Woodhouses are still raising money through their Facebook page. 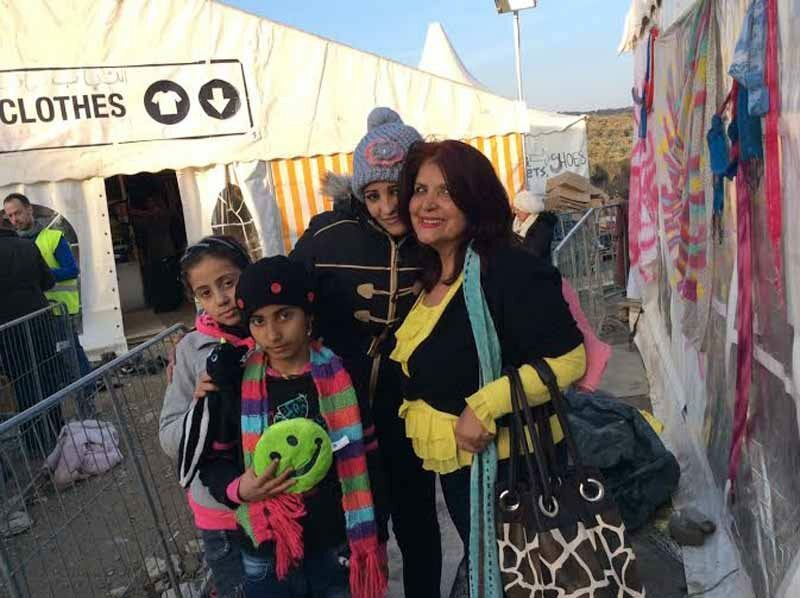 Latifa is proud that her family helped so many others who had to leave their countries, homes and lives behind. “It’s, in a way, extraordinary [that] families are still calling, saying that they have made it and thank the Woodhouse family,” Latifa said. 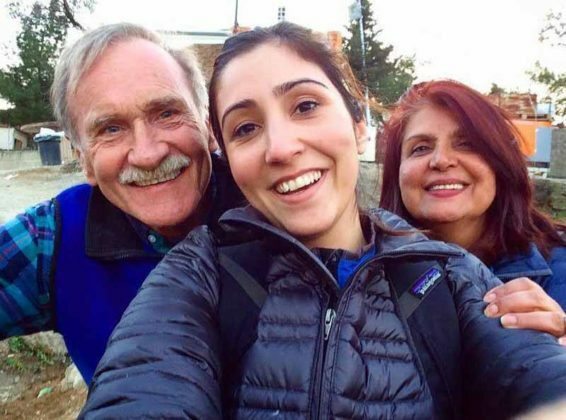 She still worries about the many people she’s “adopted” and tries to find out as much as she can about where they’ve ended up. The “We need your help” plea on its Facebook page is not just the Woodhouse family asking on behalf of themselves; the “we” is collective, the “we” of people from all different places, with all kinds of skill sets, trying to help refugees in any way they can. It is the “we” of the world, of families similar to yours—only halfway across the world—who need your help to safely find a home where they can live better lives. “It’s a horrible crisis and we have to address it as a community [and] as a people,” said Latifa. 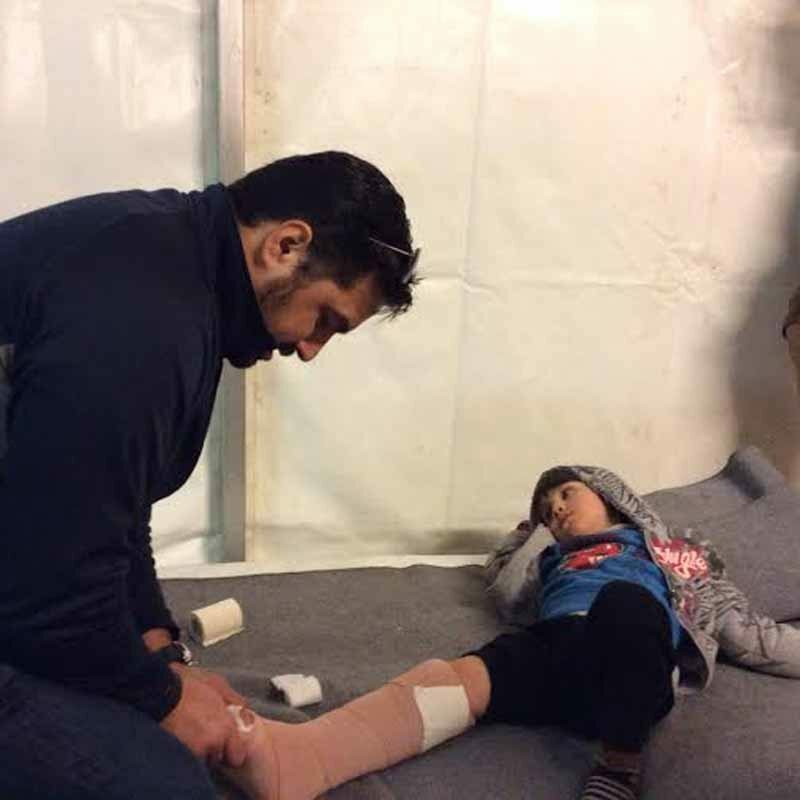 For more information or to help, go to www.facebook.com/Humanitarian-Mission-to-Lesvos-Greece-to-Help-Refugees-1688425001398202.